Clients can avail from us Hose Fittings in stainless steel 304 & 316 grades and brass. Our crimped & reusable end fittings are suitable for braided and spiral hoses. The 'ME' Hose fittings comply with the standards of DIN 20066, SAE 514, DIN 7642, BS 5200-ISO WD 8434-6, DIN 7641, SAE J 518 and SAE J 1453.
material of end connections: m. S. , carbonsteel, brass, g. M. , ss 304/304l/316/316l/321. type of end connections: threaded type. Bsp, bspt, npt, nptf, metric, sae, jic. flange: as per bs, asa, din, slipon, weldneck, rtj. 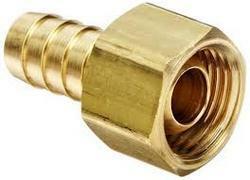 We are engaged in manufacturing and exporting a wide range of garden hose fittings.